Fine atomizing brass nozzles that can be hand tightened and seal with an O-Ring. These .012/.30mm nozzles are ideal for use in high pressure systems in arid climates. Typical flow rate is .028 gpm at 1000PSI. This nozzle is good for dry climates. This nozzle is easily cleanable and provides years of clog free misting. 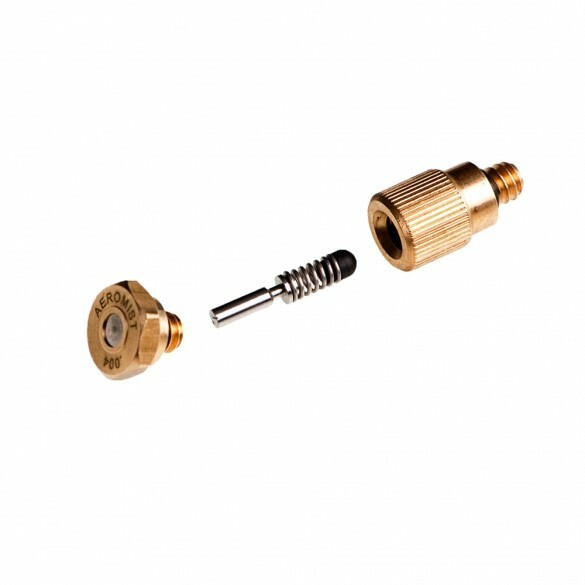 Fine, low flow atomizing brass nozzles that can be hand tightened and seal with an O-Ring. These .012/.30mm nozzles are ideal for use in high pressure systems in arid climates. Typical flow rate is .028 gpm at 1000PSI. This nozzle is great for humidification on patios. This nozzle is easily cleanable and provides years of clog free misting. Median droplet size at 1000 psi is 8µ with a 85° spray angle.